On day #2 of the ‘1st D$Dnet Training School’ advocating IGM practices, the participants were greeted by the (admittedly small) obligatory nonviolent intersex protest, also brandishing placard no. 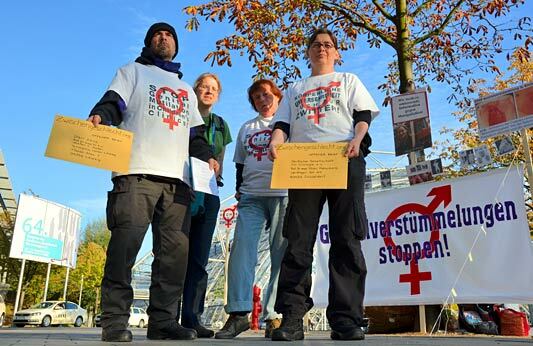 2 in a new series featuring IGM survivors speaking out – in this case Swiss intersex activist and IGM survivor, StopIGM.org’s one and only Daniela “Nella” Truffer, flanked by fellow survivors Claudia Kasper and a placard picturing the late Katrin Ann Kunze (see above). Daniela, the intersex person having participated most frequently in nonviolent intersex protests on this planet by quite some margin (current IGM protester global rank #2 with just shy of 100 actions under her belt), was prevented from attending today’s protest due to her beloved dog (and seasoned intersex protest veteran) Baiba (current IGM protester global rank #5) having just returned from ICU, fighting for her life against an unknown but serious internal infection. This blog salutes Daniela for her exceptional leadership in actively and effectively combatting both IGM practices and perpetrators, and protecting future generations from being mutilated like she has been – far above and beyond any call of duty. New WHO Report “Sexual Health, Human Rights and the Law” Criticises Intersex Genital Mutilations (IGM) – Again! i truly hope your dog recovers and somehow you find a way to fight the infection. i love dogs and i love your activism, thanks daniella for all your efforts and successes at bringing IGM to the attention of the medical world!